Behold, the godly force guiding my kettle's thermal control. I had a stellar brisket run this weekend. I've never done one very well before. I cooked my 4 lb baby fat side up for 12 hours at 200°F, then turned it up a notch and cooked it 5 hours at 240-260°F to a finished internal of 185-190°. I wrapped it for an hour while I clobbered the family in Scrabble. Zag is a word you know. The brisket was sublime. After being sliced, it seemed to taste more like roast beef than brisket. Not fork tender, still had some texture; damn good. I'm a dedicated pulled pork fan, so my palate for brisket isn't too well developed. I think it was good though. Too bad the dog's stomach didn't tolerate it so well. I will not provide details. Below is a pic of the succulence that was the highlight of our dinner. Congratulations! 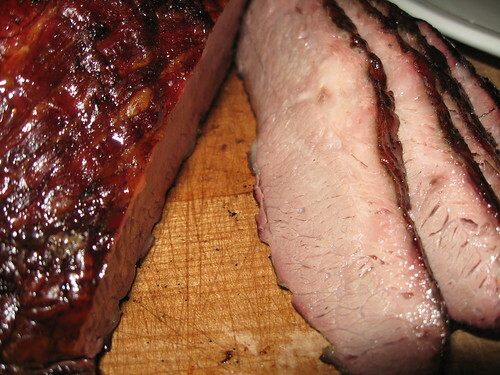 The brisket looks great! Thanks guys. The pursuit was more fun than the final target. I'm going back to pork. I think I'll use the leftovers in a brisket chili.